Tag line: "Dateline: Chicago August '68"
During my first year in college, I took a class on mass media, and part of the course required students to work on several video presentations, some assigned by the teacher, others for outside sources (the art department, student government, etc). Early in the semester, before we were placed on any projects, our instructor related a story about a shoot he had been a part of a year or two earlier, which featured an interview with a teenager who was dying of cancer. After answering one particular question, the teen, who our instructor said had remained composed throughout, betrayed his emotions ever so slightly, and a single tear ran down the boy’s cheek. As you can imagine, the classroom fell silent, but it didn’t remain so for long once the instructor told us how he reacted to this emotionally charged moment. I remember a few of us gasped at what we felt was an insensitive comment (considering the circumstances). The instructor picked up on this, and backpedaled a bit, but added a few minutes later that it’s the cameraman’s job (especially in a news environment, which is what the course was geared towards) to point, shoot, and not get personally involved. I was reminded of this as I watched the opening sequence of writer / director Haskell Wexler’s Medium Cool. In it, the lead character, John Cassellis (Robert Forster), a cameraman for a Chicago TV news station, rushes towards a car accident that just occurred. With him is the sound man, Gus (Peter Bonerz), and the two take their time setting up one shot after another around the wreckage. We eventually notice that there are still people inside the vehicle, and we can hear a woman moaning in pain. Once their work is complete, John tells Gus to call the accident in, and have them send an ambulance right away. I couldn’t help but wonder how my old instructor might have reacted to that scene. The callous nature of the news media is but one of many themes and ideas explored throughout Medium Cool, a motion picture filmed on the streets of Chicago in 1968 that culminates with the riots at that year’s Democratic National Convention. It is an energetic, sometimes explosive, and always fascinating look at America during one of its most troubled periods, and Wexler, who was also an award-winning cinematographer, had his camera on-hand to capture it all. Life is good for John Cassellis. Along with his exciting job, which affords him the opportunity to travel to different parts of the country (at one point, he and Gus are sent to Washington to cover Bobby Kennedy’s funeral), he’s also dating Ruth (Marianna Hill), a beautiful nurse who seems to be head-over-heels in love with him. But America is changing fast, and John, who occasionally goes out on his own to cover a story, is trying to keep up with it. Right around the time his relationship with Ruth deteriorates, he meets Eileen (Verna Bloom), a single mother from West Virginia who lives in a poor section of Chicago with her son Harold (Harold Blankenship). In addition, John is fired by his station’s manager (who thinks he’s a loose cannon, and therefore too risky to employ). In need of a job, he agrees to work for a documentary crew that’s shooting the Democratic National Convention, an event that is going to be much more chaotic than anyone imagined. 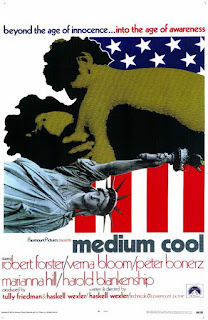 Inspired by the European style of filmmaking (especially the French New Wave), Medium Cool feels like a documentary, and, in many instances, that’s exactly what it is. Early on, Wexler and company film a training exercise carried out by the Illinois National Guard, who are practicing crowd control for the upcoming convention; and later on, when John drives into the ghetto to interview Frank Baker (Sid McCoy), an African-American taxi driver who returned $10,000 in cash that was left in his cab, he’s stopped by several militant blacks, who, towards the end of the sequence, talk directly into the camera, telling the world what’s on their minds. This real-life approach even extended to the cast: Harold Blankenship, who plays Eileen’s son Harold, was not an actor, but an actual kid from the Chicago slums hand-picked by Wexler. The height of realism, though, comes during the riots that occurred while the Democratic National Convention was in progress. Wexler and his team were smack dab in the middle of it when all hell broke loose (a cop tosses a smoke grenade directly at Haskell Wexler, who continued filming as long as he could). Wexler balances footage of the riots with scenes set inside the convention (as police and national guardsmen are battling the protesters, the song “Happy Days are Here Again” is playing on the convention floor), as if to demonstrate the deep divide that existed in America at that time. Medium Cool has more than its share of dramatic moments, but nothing compares to the electricity of its final scenes. A movie every bit as hectic as the period in which it was made, Medium Cool has something to say about a good many things, including racism, violence, poverty, women’s rights, and the media in general. It is more than a motion picture covering a tumultuous episode in American history; it’s a time capsule of a difficult era, and one of the finest movies to emerge from the latter half of the 1960s. Thanks for sharing your personal anecdote, really speaks to the themes of the Medium Cool. I don't own too many Criterions,but this was the first one I ever purchased.